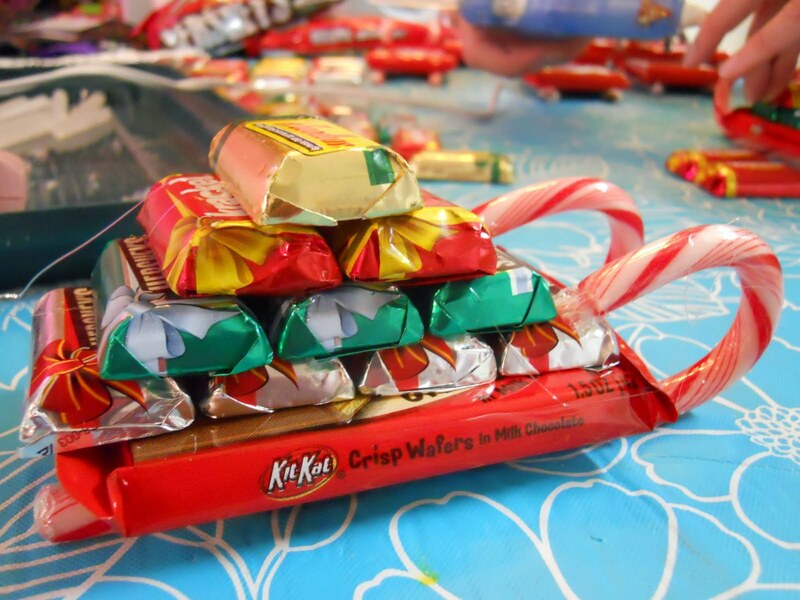 Last week at Bring 'n Brag, one of the ladies showed us how she made candy sleighs for Christmas gifts. update! The lady who showed us the sleighs is Lois. Thanks Lois! Joellen and I decided we needed to make our own! They were fun to make. We made a dozen of them in about an hour and a half (plus wasted time driving around town looking for Christmas ribbon!) I think it was much easier doing them together so we had extra hands. One person to hold while the other one glues... especially for the first step! 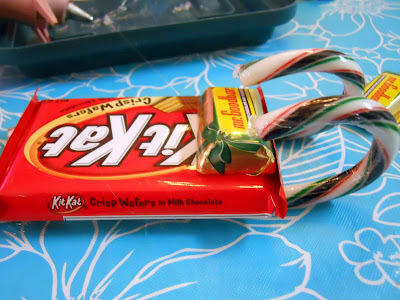 First you glue a kitkat bar to two candy canes to create the base. We used hot glue and ran a strip of glue down each candy cane. After all the glue is hard and secure, glue ribbon around your "packages" and a bow on the top. That's it! so cute and fun and your recipient can keep it as a decoration or take it apart and eat all the candy! I think you should all make some. Come on. You know you want to! Oh, these are so adorable - I have to put this in my idea file for next year! UGH! Don't show me THIS!!?? I don't have TIME to make any and now I really, really want to!!! But there is always next year. Right? Hey! Made 4 of them this evening. My helper was getting bored. Lol! I will continue tomorrow. Wow! These are cute! Great idea.....thanks for sharing it. Does the glue gun melt the chocolate? Is it hard to pull apart and eat?? these are very cute and could be customized for each person. I am thinking I would glue the little gum packs....the "old timey" kind that have 5 sticks in each pack...juicy fruit and double mint....instead of the chocolate bars....you could also probably use glue dots from the scrap book section of your hobby store if you didnt want to use hot glue but I bet the glue is stronger...thanks! I think I will try this too! OMG! I love this and am making some tonight. Thank you! I just made a fun little Youtube video using your creative idea. Thank you so much for sharing. I had a lot of fun making these. They are just to darling to not make. These were a must even if they were made last minute. I just made these today for the ladies at my son's daycare! They are quick and easy! Thanks for sharing! Thank-you so much for this easy and original idea......just the thing to make last minute or stick in a basket to finish it off....I just made a bunch to give out and they were so easy and turned out so cute...Merry Christmas! Too cute! I will definitely have to try this Christmas 2012! Thanks for sharing! this is such a cute idea. I will have to remember it for next Christmas. thanks for sharing. Love this. Very creative. This is a great gift. Thanks for sharing. They are great!!! Going to make some this year for Christmas gifts. I think I'll add a name tag for the kids to find their seats at the table for dinner. cute idea! I am definitely going to make these. So cute, so simple. Thanks for the idea and pictures. 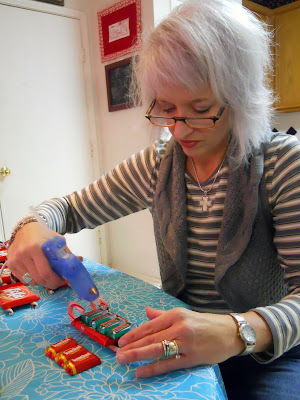 Try using one of the small "cool" glue guns as opposed to a "hot" glue glum. They work great for things like this. I love this idea, but I think I'll use rubber cement instead. Going to make these for my mothers group and stocking fillers for my niece and nephews! What a super idea, I think time allowing i'll have a go at these if i can find the candy canes. thanks for sharing. These are adorable! Have to make some for the senior christmas party! These are cute. I did something simular last year. I used candy canes as a sled. Took different size round styrofoam balls and made snow men. Put a hat, scarf on the snowmen. They were really cute also but only last for the season as the candy canes discolored when I took them out the next year. Has anyone tried them with glue dots or something other than a glue gun? I plan on making these with my daughter. They look real cute and as a first time crafter I'm hoping they won't be to hard to assemble. One comment was about using rubber cement. I don't think I would do that, as it has a strong odor that the chocolate will pick up and I don't believe it is nontoxic. I would stick with (no pun intended!) low melt hot glue or glue dots. I use these to make juice box trains and robots. The only problem I have found with the hot glue is if you live in a cold area and they are exposed to a great change in temperature, which causes the items to come apart. Tacky glue would work, but it doesn't dry that quickly. Since these are also tied with ribbon, it should be fine. "I think you should all make some. Come on. You know you want to!" Funny you should say that. :) My Mum saw this on Pinterest and emailed it to me and we're going to have a go at making a few of these. It's such a lovely idea and doesn't look too complicated either. This is a great idea for stocking stuffers or gifts for the Teachers! I will be making some shortly. Thanks for the creativity! I am a school bus driver and try to do something special at christmas... I think I have just found it! I bought a roll of "glue dots" for just such a project as this! I am definitely going to make some! where did you get the tiny bows? I have been looking all over the place for them? Thank you so much. This is such an affordable gift for a lot of people. We had a go at these this afternoon and we're so pleased with how they turned out. I thought we'd gone a bit overboard with the supplies, but most of it did get used. I plan to fill boxes with these and send them to my son who is stationed overseas. He and especially his fellow Airmen love getting treats! I always send an extra box for him to share.....it's a great idea for deployed also, just change it up a bit with less chocolate - like one poster wrote, use gum, or other items. Great idea! thanks for sharing! What size candy canes? the normal ones like at walmart? Love these. Found you through Facebook via Sherry Godsey. I am going to be your newest follower. Please stop by and follow along with me. Blessings! Omg I love them I'm gonna surprise my little ones I know they will love the whole idea of the sleight...thanks great idea!! I live in a Mobile Home Park for the elderly. I think this is a great idea to make for everyone and give out as a little treat. Thank you for the fantastic idea. I'm making these for my residents at my apt.bldg. Thank you for the instructions! These are so cute. Going to make some with my grandson. Keep the ideas commming. These are so cute! Great idea to make and give to the family. I don't have much money, so these would be just the right thing I could do. Even though everyone is older, but I know they'll love it. Thanks for sharing. I just love these. Going to make them with my granddaughter (4 yrs old) and my nephew (3 yrs old). They are going to give them to their teachers and bus driver. We will use either glue dots or double sided tape. I am also going to make some for the ladies at the office. Thanks so very much for sharing the idea. For those not wanting to use hot glue, Glue Dots(http://www.gluedots.com/glue.html)are an alternative. They are really strong. They are at Michael's and Hobby Lobby and other craft stores. Ellyn, I think I met you a few times at Bring and Brag at Q.A. when I lived in TX. I recognized Joellen. :) Nice to see you have a blog! I just made a half dozen of these. I ran out of glue sticks so I started taping down the small bars and it worked perfect. I plan on making more and I will just glue down the large bar onto the candy canes and use tape for the rest. I also used some Reese's Peanut butter cups as well as Kit-Kats. I added a small Santa bar on the front as well. i think i am going to do this for my son's teachers, at the moms morning out program. instead of a regular sized candy bar i am going to use a starbucks gift card, just making them smaller. i also will be using double sided tape.maybe i can make a pipe cleaner reindeer to drive it....lol. Any ideas for a person with diabetes? I am going to make this for my class, such a great present idea. Even my boyfriend was oohing and aahing over how adorable these are. So awesome, so fun, so easy, so so so rewarding. Thanks for this. You are officially the COOLEST person...ever! We just made 12 of these and we loved it, very easy. We even made a special one for Lanie who can't have chocolate or nuts, we used tic-tac and life saver rolls looks as cute as the rest. Thank you so much for this idea. Merry Christmas. I used a hot glue gun, but I froze the chocolate before assembling, and there was no melting! These came out so cute and were actually pretty easy to make without a helper. Thanks for the wonderful idea! Awesome idea. Every year i try to come up with something cute to give my coworkers. I just made 12 of these and it was very easy. Thanks for the idea. I am making some tonight for work!! I saw these on your blog yesterday and rushed out to get the supplies. My son and I made 12 of them this morning and they came out so cute. They were so quick and fun to do!!! I did half of them with the regular Kit-Kat and half with the white chocolate Kit-Kat. We also put a small chocolate Santa (perfect size for the sleigh) on the front. The only thing we used the glue gun for was the candy canes. For the rest we used a crafters adhesive roller. So easy and no mess. Thanks for the great idea and perfect instructions. The above post is mine as well as this one. My husband took my daughter out just a bit ago to deliver these to her friends. They were a HUGE hit!! (the parents loved them as well). On the way home my husband called me and said that our daughter wants to make some more for other friends - - so they stopped off at the store and found everything they needed to make another batch. But no worries...they are easy and done in a flash. Two dozen this year. These are just adorable! Thanks for the detailed instructions! Just a quick note to let you know my sister in law made these for all of the kids this year and they were a big hit. I posted a picture of her creation on my blog, but gave a link to you for credit. Have a happy New Year! I made a few of these for Christmas 2012, they were a big hit with all my family, both kids and adults. My little sister took her sleigh to a school show&tell. Nice pack and wonderful unique idea when ever i book flights to Islamabad from Heathrow i bought a gifts out side the airport for my parents and friends in Pakistan. Making for Christmas 2013. Thanks to you for your creativity and pinterest for the place I found it. I was also thinking to use the glue dots. Especially for little helpers. Great idea fir the dinner table. I love this idea, my mom and I are going to make some of these for my mother's friends and neighbors. I am also going to make some for my grandson's friends in High School. I know they will love it. He is always looking for something to give them so they know he thought of them, but can't spend much money. (mostly the girls :o)} This is perfect. Also, great gift for teachers for my younger granddaughters. Thanks for this wonderful idea. If you are concerned about the hot glue melting the chocolate use small pieces of double sided tape. That is what I did when I made this years ago.. These are so cute! I think that I'll make these this year. Thanks for sharing the idea! These are adorable and affordable. Perfect favors or give aways! I'm wondering if you could use glue dots instead of hot glue? I'm going to try it out! Great idea - they are adorable! Great ideal thanks for sharing. That is so utterly adorable!!! I WILL DEFINITELY MAKE THEM FOR THE LITTLE ONES AT CHURCH!!! A WONDERFUL IDEA AND SO CUTE!!!! !THANKS SO MUCH!!!! Great idea. I will add a name "tag" to each one for a name place cards for our company Christmas party. Thanks for sharing! Mini hersheybar are in the Halloween candy section at Wal Mart. These are so cute. I'm thinking glue dots would work especially if you're working with children making these. Going to do this with the kids and super sticky double sided tape. LOVE IT. You could also use glue dots or strips (found at Michael's / Walmart / Hobby Lobby. I m going to make some for my kids school. I can't wait to make these - I know they will be a big hit at the fairs I do!!! thanks for such a fantastic idea! You can also use glue dots to glue the candy bar to the candy canes and the smaller ones on top. This is so cute! Definitely making these! Thankyou, What a great idea; I will make them for Christmas, and use them as Placecard's, at my Dinner table, I'll bet everyone will enjoy that. its great that you replied here because I was wondering too! thank you! I made these one year using a Hersey Bar as base. They were tooo cute. Yours are fantastic. I have a daycare and I am going to make these!! his is a great idea! I have a daycare and I am going to make some. You could put a gift card in between the kit kat and hershey layer to make a gift card feel like more of a present! Walmart is a good place to find all candies. Around Halloween, it should be out on the shelves. How about the clear dots they use for scrapbooking? 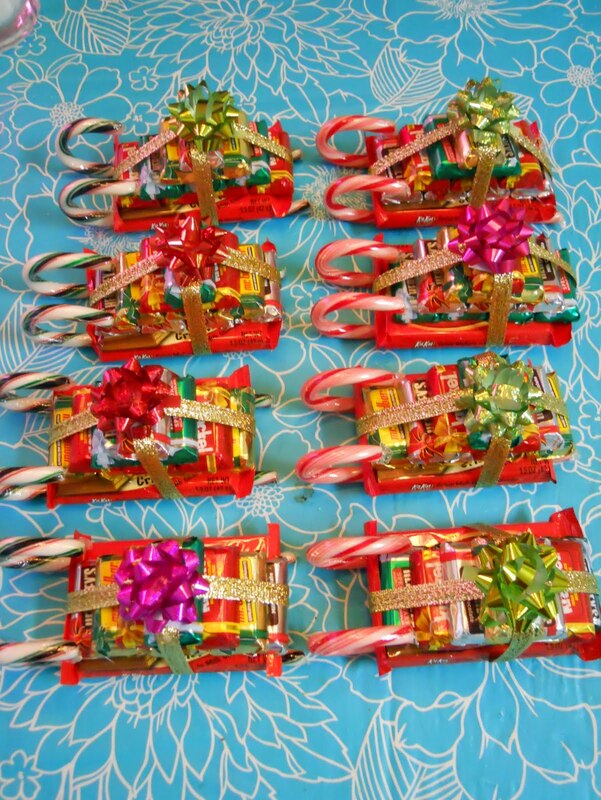 Thank you for the suggestions for non chocolate sleighs, plan on making them for members of group we attend and 5 people are unable to eat chocolate. My name is Laura, and I am the editor of AllFreeChristmasCrafts.com. I am contacting you because I would love to feature some of your craft tutorials, like this one, on AllFreeChristmasCrafts.com. I know my readers would love your content! My email address is lplack@primecp.com. Please let me know if we have permission to feature your projects and photos on AllFreeChristmasCrafts.com and in our newsletters, which reach over 100,000 subscribers. I look forward to hearing from you! Great idea!!! All my children are grown, this is a creative way to give them candy and save the stockings for the grand kids. Thanks for the idea. BTW I marked your blog ... You have one more follower! it would be a great idea to make for the XMAS Bazaar....what would be a fair price to sell them? Does the glue gun melt the plastic wrapping on candy canes? What can I use instead of mini Hershey bars as I'm in Australia? Just made a dozen of these. So very easy to assembly. GREAT idea and fun to make!!! For all of you looking for the mini Hershey's bar, check online. I found this site in the UK. If concerned about the hot glue melting the chocolate, maybe glue dots could be used. If I make them, that is what I will use. I just made 60 of these sleighs. 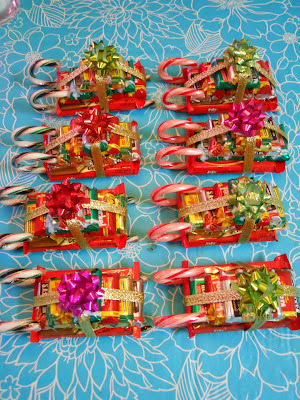 I tied ribbon just around the candy bars then used small dots of hot melt glue to secure the candy canes. Then added the bow. Worked perfectly and I could do it by myself. Cute! I'm going to make them for all of my son's teachers and aides and therapists! Wow, that's going to be a lot of candy! I'm a bit worried about the hot glue, since I'm not very coordinated to get only a dot on there (I tend to end up with a big glob! ), but I did get some of the small glue dots, so might try both and see which works best. For those of you in Australia I just found packs of the mini Hershey bars at our local Reject Shop (one of our "dollar stores"). Happy crafting and Merry Christmas!! Just got done making 9 of these for my grandsons' classmates in preschool...eeeeasy and fast. I bought a "party size" bag of Hershey's minis, after Halloween for 1/2 price and it was enough to do 11 sleds without using any of the peanut bars since schools ban peanuts due to possible allergies. I'll definitely be making these again...there are so many possible uses. Fundraising, gifts, name place card holders, party favors, gift card holders. I'm in the UK and am looking for an alternative to mini hershey bars as all the ones from the UK are very expensive. So I was wondering what else is the same size? I used mini soaps (in boxes), notepads, santa tea light candles for mine - you can use just about anything as long as your dimensions are right!! In the process of making 30. They are going to be favors at our X -Mas party at work. Thank you for the idea. I love these! Found them on Pinterest. I made 22 of them and took them to the icu nursing staff. My husband has been with them for 38 days and they are wonderful. (Glad to report he is making progress after a very scary time.) The nurses there last night loved them and I'm sure the others will also! I didn't use the ribbons and bows and I know they would have been cuter with them but I didn't have the time or energy to go searching. Also I only used of the small sized bars since they are expensive and I was making so many...still cute! Instead of using hot glue, maybe double sided tape would work? I will be making 16 of these and will be trying the double sided tape with so transparent tape on the part holding the cane to the kit kat. I am hoping it works out. I will let you know. Thanks for the idea! I just made ten of these last night - and will add the finishing ribbon and bow to the last eight today. I am NOT a crafty person at all, so I am happy to report they came out great! I made them for my bosses and coworkers. For all concerned about using hot glue, I used my hot glue gun and hot glue with no problems whatsoever. I just found these and am going to make them. Think they are adorable! Can't wait to start them today and pass them out to my neighbors tomorrow. We made 102 of these for the residents at my assisted living center. Absolute hit! Have you seen how many times this has been posted to Pinterest? Neat gauge on how well you're doing! Congrats! I belong to a well known ladies group, and have been asked to help with the Christmas decoration. I plan on making these this year (2014) and place one at each place on the table. Plus I am thinking of making the light bulb penguins, with a silver ribbon attached to the sleigh as though he is pulling the sleigh. this should be very, very cute. can't hardly wait to see the expressions on every ones face thanks so much for posting this cute idea. what kind of mini hersheys did you buy exactly im just wondering i saw mr.goodbar but what were the others? I was surfing the internet looking for a little present I could make to give to my good friends at school, and these are perfect! Tonight I made 12 of the bases (have to finish them tomorrow after school), but I couldn't find any hersheys :( So I used Cadbury Dairy Milk Bars with some freddo frogs and mini mars bars! Cute as. It's a brilliant idea. Love it! I think a little chocolate Santa on top would be cute, too! This is such a cute idea, will have to try "ASAP". Thank you for sharing. I was trying to come up with a creative, inexpensive gift for co-workers. They all love candy so this will be perfect! I made these for my son's xmas at school and they were a hit!! I am the worst crafter there is and I did quite well as your instructions and pictures were excellent! Thank you for sharing and helping me to have a little more confidence to try more craft projects. Great!! Just made up 10 of these for my granddaughter's birthday party tomorrow. What a fun little party favor this time of year!! I thought this to be a great idea and I made some for my Card Club (Canasta) and they loved them. Then I made my Ladies Sunday School Class some and both loved them. So, that will be on my list next year to make again. Thanks for sharing this great idea!! Love it!! I think I will make some of these for the little ones around my house as well as putting one in my mail box for Christmas. Doesn't the hot glue melt the chocolate? What a wonderful idea! My daughter works with seniors and I work with children. I was also wondering if glue wont melt the chocolate. Absolutely adorable & definitely going to make some of these. I have something similar to this that was on the back of a candy cane box but never got around to doing it and it was in living color like these. Thanks for your post. Use the not so hot glue gun, it won't scald your skin if touched but warm enough to melt the glue. I have both. Is the candy hard to get loose from the glue is someone chooses to eat it? I made these and used glue dots, from oriental trading, It was alot easier and I didn't have to worry about the heat. I absolutely love this idea. I'm going to do this for the girls at work as a secret Santa gift! Thanks for this perfect idea. Your AWESOME! !!!!!!!! Your AWESOME! What an excellent idea. I'm gonna make them for my co-workers at work as a Secret Santa gift. Thank you ever so much!!!! Where do you find candy canes like those??? I totally love this! It will be perfect as part of my book tour next year to promote my children's Christmas book. Jason, Lizzy & the Snowman Village! I made these last year.Gave them as something a little extra for my neices and nephews and to teachers. Super cute! I **LOVE** this idea! I may just have to do this for my family and friends. Makes a great stocking stuffer, a great simple gift when you need one in a hurry. ( that is if you keep a few made up)can decorate the tree and then enjoy later. This is something your kids could help with if your not using hot glue but glue dots. great teacher gifts that your kids can give. Don't forget to add the chocolate Santa to drive the sled. How Awesome & Affordable Thank You Ellyn For Sharing this!! God Bless your Heart! I just found these yesterday. I went out and bought the components immediately! 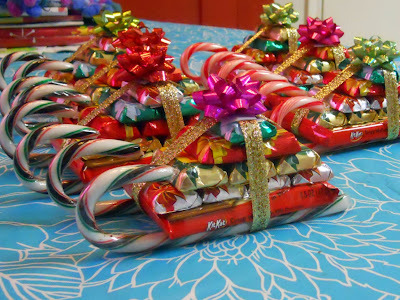 Last night I made 10 sleighs and they are so cute! I wasn't able to find the Santas quite yet but I'm sure I will come across them this week. These will be favors for a Christmas Party I'm attending. We all bring something and these would be really cute to share with these gals. Thank you for posting. These are the cutest things ever and so easy to make. I made 35 of them last weekend and used double sided tape instead of the glue gun. It was so much easy and so fun. I mixed it up by putting different candies in--anything flat will work just great! I can't wait to give these out to people! Welcome to my blog! You never know what might be going on here.... sewing, weaving, crocheting & all manner of fun crafting, with a healthy dose of other quirky stuff thrown in. Glad you could make it! Year in review - other stuff! my ticker tape stack is growing!